Tea Time Tuesday: It’s all Green Today with a side of News! Hello! Wow, it is so dark and gray outside, that it looks like rain or a major snow storm is upon us. Thankfully none of the above. Just gray and gloomy. But oh so perfect for tea time. Today, I chose a Green tea I bought from Wenham teahouse last spring. It’s called Cherry blossom Green tea. 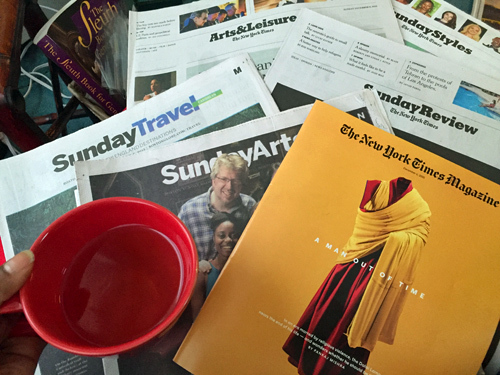 I steeped it about 3 minutes and headed up to my nook for a look at last Sunday’s newspapers. The tea is so soothing while I take in the current events. I used have a Boston Globe subsription and then it began to be too much so I now purchase them a couple times a month. I also enjoy the New York Times so I bought both this past Sunday. What I do is pick out what sections I like and read them bit by bit throughout the week. Some weeks, I am a success and other weeks I get caught up and only one or two articles get read. I tend not to to watch news on the television, because 90% is about death and morbid and I have young children in the house. I like reading news so that I can focus on integrity verses the onslaught of sensationalism that is dominating our daily news channels. I also subscribe to The Washington Post on my Kindle and read a bit each day. I enjoy the interactive elements in their articles. Another online resource I read is The Christian Science Monitor. I first must say I am a bit biased since I worked there for many years. But the quality and integrity of the reporting is top of the line. I am going to go finish my tea and read another article before I head out to pick up my boys. Hope you grabbed a cup of tea today!